This place is in a shopping plaza and will have your GPS running you in circles to get there. There were two offering of brews here and they sucked out loud. The place was filthy. There is absolutely no reason to stop here especially when Ithaca Brewing is close by. Avoid this place like the plague. The rest of this review is just going to be words so that I can get to 75. 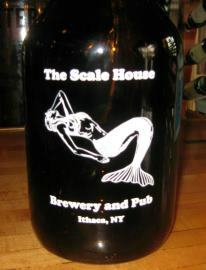 This is a small brew pub on the outskirts of Ithaca. It was a bit difficult to find, and not really worth the effort. When I was there they had a light beer (Pilsner) and a Dark beer (Bock). I had the Pilsner, and it was too light, watery and tasteless for me. My friend had the Bock, which was a little more flavorful but still not really that good. I think the high point was the free goldfish crackers that they had at the bar.